Knossos Beach Bungalows & Suites is a beachfront resort offering luxurious amenities and facilities to the guests. Guests can take a refreshing dip at the outdoor pool. This resort close to the Archaeological Museum, is just 15 km from the Knossos. Knossos Beach Bungalows & Suites has plenty of upscale restaurants, pool bars and 2 beach bars. 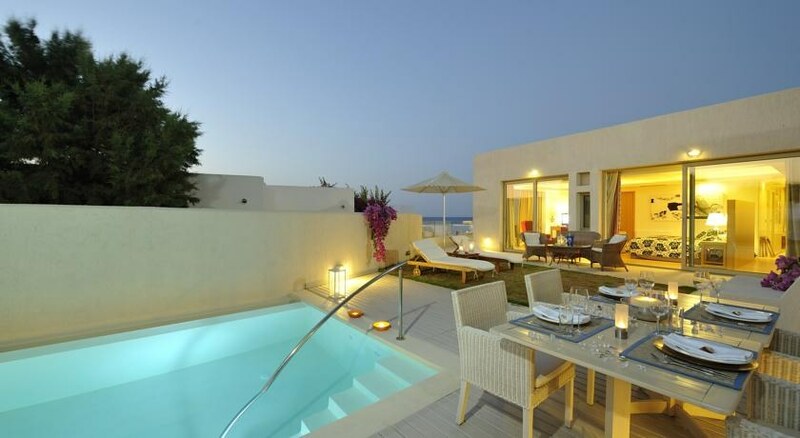 There is plenty to relax and enjoy for the guests in Knossos Beach Bungalows & Suites. One can stay connected with the free Wi-Fi facilities throughout the premises. This is a top favourite of tourists for its wonderful location and warm hospitality. This luxurious resort is just 12 km from the Heraklion Archaelogical Museum. The Knossos town is just 15 km from the property. Guests can visit the various eateries, bars and shops here. The easiest way to reach the property is via Nikos Kazantzakis International Airport at 6.2 miles. 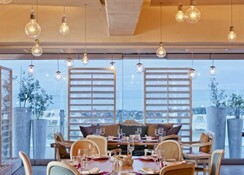 This hotel is located at a distance of 7.5 miles from Heraklion port. 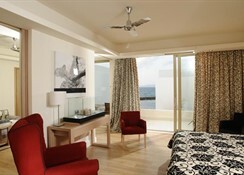 The hotel offers a total of 132 rooms and suites for its guests. 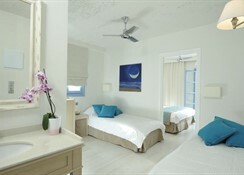 There are bright rooms at Knossos Beach Bungalows & Suites which offer balconies, mini bars, flat-screen TVs, free Wi-Fi. There are posh suites and bungalows here offering luxe facilities right from marble bathrooms and private pools. Some rooms offer whirlpool tubs. Some rooms have terraces with sea views. Guests can avail room service at any hour of the day. On the food front, there are plenty of dining options at Knossos Beach Bungalows & Suites. 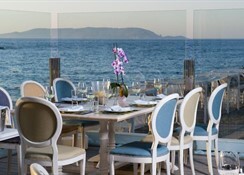 A buffet-style Mediterranean restaurant with stunning sea views, a pool bar and 2 swanky beach bars. Guests can sample creative Greek cuisines prepared with local ingredients. A pool bar serves ice-creams and drinks. A streamlined spa at Knossos Beach Bungalows & Suites offers pampering treatments to guests. There are 3 outdoor luxurious pools here. Guests can sweat it out in the plenty of sports courts here. A private beach club with lots of water activities will keep you entertained for long. One can find water ski, canoe and Jet Ski here. Yoga and Pilates sessions can also be arranged. The private sandy beach here is equipped with umbrellas, bar and loungers for relaxation.